Gajendra Moksha is a story found in the Bhagavad Purana and it shows the significance of Bhakti, prayer and true devotion. Gajendra, the elephant, who is the protagonist of the story, was a king named Indradryumna in his previous life. After ruling the country successfully for several years he decided to leave his throne and go to the forest and spend rest of his time in prayers. In ancient India it was a practice by spiritual people to leave the materialistic world once their duties as Grahasta (householder) was over and under take Vanaprashta (life in the forest). The king left for the forest and here he made a small hut and started meditating on Vishnu. One day a saint came to the hut of Indradryumna. But the king did not notice the arrival of the saint as he was deep in meditation. This angered the sage and he thought the king was purposefully insulting him and cursed him to become an elephant. The elephant now roamed in the forest and soon came across a herd of elephant. The king of the herd challenged the new male elephant. And Indradyumna defeated the king of the herd and was named Gajendra. Animal instinct overtook the king. He now became arrogant and egotistic as he controlled the strongest animals in the forest. Once while drinking water from a river, a crocodile caught Gajendra’s leg and refused to leave it. Soon other elephants started deserting him and Gajendra was left alone to fight the crocodile. After trying all methods, he realized that only Lord Vishnu can save him. 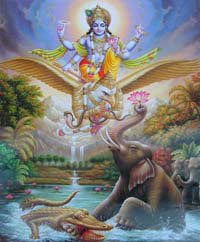 He prayed to Sri Hari Vishnu – Soon Lord Vishnu appeared before him and on seeing the Lord, Gajendra plucked a lotus with great effort and offered to him and said ‘Narayana, Preceptor of all, Bhagavan; I bow down to you.” Gajendra was instantly released from the grip of the crocodile. This is a symbolic story writes Sant Keshavadas. The egoistic soul is the elephant. As long as we are young, healthy and wealthy, we feel many people love us and we become egoistic. The crocodile symbolically represents death, which ends everything. When we are caught in the jaws of death, there is no one who can save us. Friends flee, relatives disappear. Our own body fails us miserably. Like the elephant in the story, the only solution from suffering is to turn to the Lord. In the moment of that utter surrender, God rushes to our aid, destroys death, and releases our soul from the clutches of death – and that is liberation or Moksha that comes by the grace of the Supreme.